Dunston Hall Hotel01508 470444work HotelDunston Hall is a superb Elizabethan-style 4-star hotel, set in 150 acres of stunning wooded parkland. Conveniently located on the outskirts of Norwich, Dunston Hall offers 11 spacious meeting rooms as well as a beautiful Garden Marquee. It also boasts 166 en-suite bedrooms and full leisure and golf facilities. With three dining options to choose from, there is plenty of choice. Our Brasserie Restaurant offers a rotisserie style carvery, providing buffet style service of starters, mains and desserts. The informal setting allows you to sit back and enjoy the views of the hotel gardens whilst indulging in a mouth-watering meal. Alternatively, you can choose from a range of local must-try dishes, afternoon tea and refreshing drinks in our Garden Terrace Bar. Our Bunkers Bar offers an informal dining area with breath-taking views over our championship golf course and is perfect for relaxing, whether a golfer or not. Dunston Hall is a superb Elizabethan-style 4-star hotel, set in 150 acres of stunning wooded parkland. 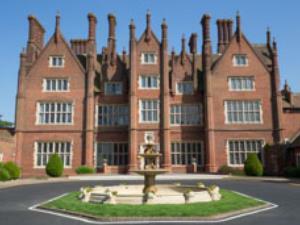 Dunston Hall is on the A140, Ipswich Road. From M11 take the A11 towards Norwich. At the Thickthorn roundabout take the A47 towards Great Yarmouth, leaving at the next exit, the A140 towards Ipswich. The hotel is a mile further on the left. From Norwich - 6 miles by taxi.